I might be off base, but I know what you came here looking for. At least I THINK I do. . .
Today's the reveal day for the 7000 Bracelets of Hope Blog Hop as hosted by Lori Anderson of Pretty Things. The task: Make ONE blue jeans/denim inspired bracelet an send it to The Global Genes Project to be given to a family that has a child suffering from a rare disease. Easy enough! The hardest part of the task (or at least in my eyes) was to make a bracelet that could fit any adult. My solution? Memory Wire!!! Of course! It hit me like a bolt of lightening that memory wire would be the perfect material to use for this project. After, that it was down to deciding on the blue beads. I stumbled upon these marble-y blue glass beads that were gifted to me and felt like they were the perfect worn jean color. Somehow, the light just wasn't perfect to capture the color. I used simple silver beads as a symbol of the simplicity of jeans. As well, I added some lacy silver bead caps. The bead caps seemed to give it just the right touch of country. I used memory wire too! Love your bracelet. cool design and very cool beads...wonderful job! I love it, great with jeans! Memory wire! Brilliant! I love your design- simple and elegant. This will be greatly appreciated by its recipient! PERFECT ! that would look great with jeans and much more!!! What an eye-catching design. Someone will be happy wearing it. Pretty blue beads- they look so different in the natural light. 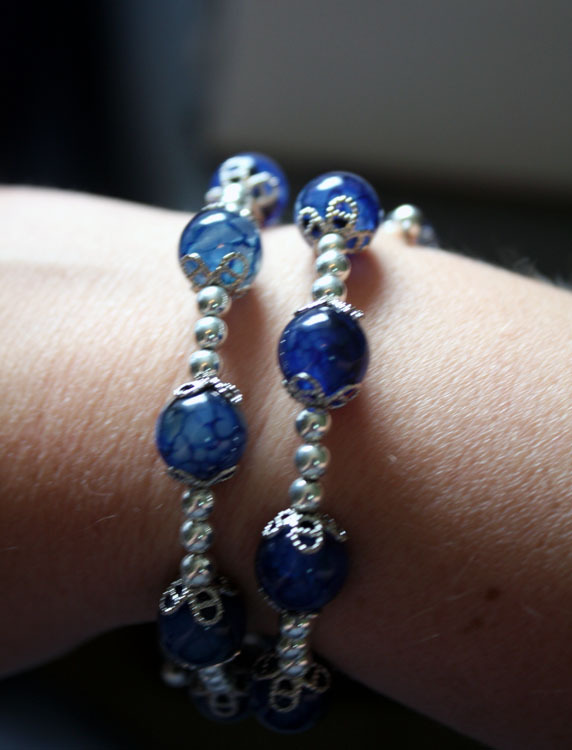 Pretty Blue beads- they look great in the sunshine!! Those beads are stunning and brilliant use of memory wire Hope!!! A Beautiful bracelet!!! Lovely! This is going to be a hit! Beautiful, and so smartly designed!! The recipient is going to be thrilled! 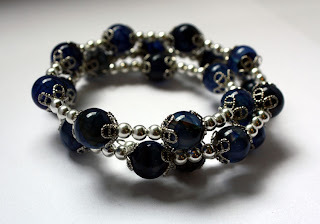 Love that you used memory wire for the fit factor and those blue marble like beads are fab! What a sweet bracelet & great idea to make it out of memory wire! beautiful and comfortable and a great everyday piece. very nice! It is so pretty! Memory wire was a good idea! Love those blue beads and lacy caps. I'm so happy to see that someone else used memory wire! I thought it might not be in vogue, but had the same thought as you - it will fit anyone. I love your version. You captured the blue denim theme beautifully. The memory wire was a great idea! Lovely bracelet! Sweet and pretty! Hope you came through yesterday's storms okay! Love your bracelet...great with jeans and a tee. And, thanks for the kudos. Great bracelet - I love your solution for adjustable! Those marble blue glass beads are awesome and your design is beautiful! memory wire! genius! perfect solution! nicely done. Great idea to use memory wire. It will look great with jeans. Oh, you did a great job! I love the blue and silver, and the lacey caps are wonderful. Made me think of champagne bubbles, which make you giggle and feel light-hearted. I pray the recipient will feel the same when she gets your beautiful design. From one southern gal to another, this is simply to die for, great work! Great idea to use memory wire! I always forget about that stuff. But that makes it truly one size fits all. Brilliant! I love those beads! A gorgeous blue! That is really a pretty bracelet. 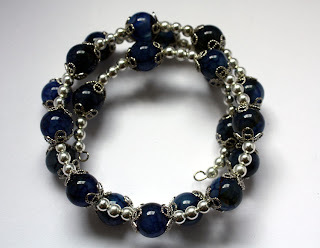 The blue beads are a gorgeous rich color and go so well with the silver ~ So Pretty! You did a lovely job. I'm sure it will be treasured. Love it! What a great idea to use memory wire! What a great idea to use the memory wire! Love your bracelet.